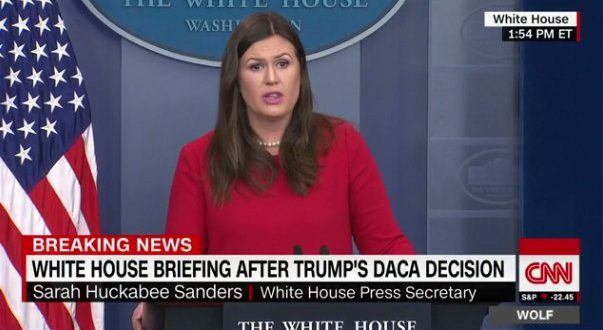 Sarah Huckabee Sanders On DACA Reversal: It's Not Cold-Hearted For Trump To Uphold The Law [VIDEO] - Joe.My.God. “It’s not coldhearted for the President to uphold the law. We are a nation of law and order and the day that we start to ignore the fact that we are that, then we throw away everything that gives these people a reason to want to come to our country. If we stop becoming the country that we were envisioned to be, then we throw away what makes us special, which makes America unique. This President’s not willing to do that. “The previous administration was, this one isn’t. But we want to have real solutions. We want to have laws that address these problems, but it’s Congress’s job to legislate, not the president’s. And we actually want to uphold the Constitution, and I think people across this country should be celebrating the fact that they have a President that is standing up and upholding the Constitution as he was elected to do.” – Sarah Huckabee Sanders, speaking at today’s briefing.